10 SCOTTS at Grand Hyatt Singapore is more than just a hotel’s tea lounge. Impeccably designed with a collection of rooms, it makes you feel right at home. Like being in your living room where you can host a group of close friends over drinks, the cosiness is unrivalled and one that replicates the warmth of home. Or, it can make a quiet meeting place to have coffee with your clients over some corporate talks. It also works as a lovely library where you can enjoy some me-time and retreat into your shell. On days when you feel like taking a break and giving yourself a little treat, the afternoon tea at 10 SCOTTS at Grand Hyatt Singapore is just the thing you need. It comes in an elegant two-tier glass tray that is packed with lots of goodies. The items change periodically, but there will always be a staple selection of sandwiches, tarts and quiche, as well as all-time favourites like the delicious crab cakes with remoulade sauce that we are not ashamed to admit wolfing down several of it at a go. Other snacks include the freshly-made seafood popiah (spring roll), samosas, and scones served with homemade raspberry jam, clotted cream and kaya (coconut jam). There is a also a self-serve freezer that houses a varying selection of salads, cold dishes and homemade ice cream as well as a communal table with over six different freshly made desserts. The stars of the show include the anti-griddle fried egg – with vanilla ice cream forming the egg white and mango passion puree representing the yolk – and a beautiful flower pot dessert that is really a generous helping of salted caramel ice cream and chocolate soil, topped with chocolate brownies and delicate edible flowers. In addition, the afternoon tea comes with a selection of hot dishes from the live station, cold cuts, artisan cheese and bread. And the best part of it all? 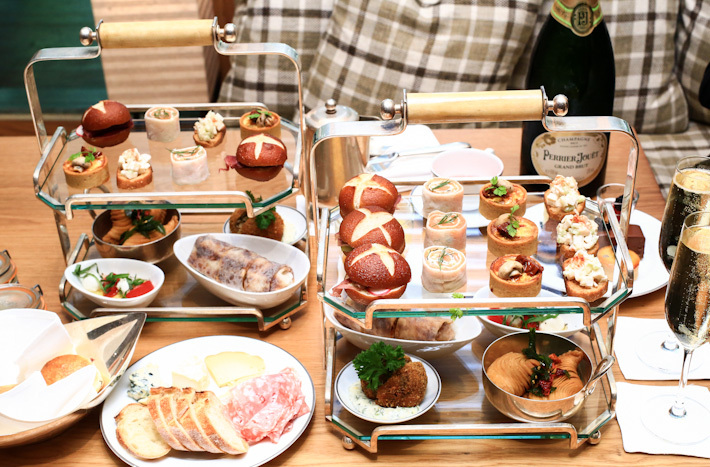 Everything that you are served with at 10 SCOTTS’ afternoon tea is refillable. The only danger is you will end up eating more than you should. But sometimes, all of us deserve to indulge a little, so go ahead and spoil yourselves. 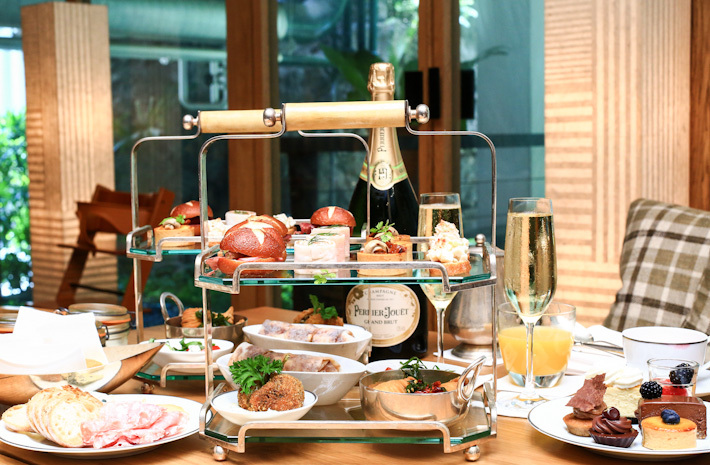 On weekdays, the afternoon tea at 10 SCOTTS is S$43++/pax with refillable tea, coffee and fruit juices; and S$73++/pax with free-flowing of Perrier-Jouët Champagne. On weekends and public holidays, the prices are S$53++/pax and S$83++/pax respectively. This post is brought to you by Grand Hyatt Singapore. The 3-tier goodies is non-refillable.